Top 5 Web Hosts that allow month-to-month hosting. Most hosting companies don’t accept month-to-month payment basis, they want you to pay for at least a year upfront. Though this can save you a huge sums of money, sometimes you don’t have this required yearly amount at once. When I first hosted my websites, I wanted a host that can accept a monthly hosting because, I was to split a small share from my monthly salary to be able to host my websites. I couldn’t afford a 12-month pay upfront. Paying over $100 for a 12-month hosting upfront can be unfordable sometimes, yet setting aside a $10 monthly budget for your hosting can be much more affordable. On a monthly basis, this is affordable especially if you plan to use your monthly salary to pay for your hosting. Best way to wet your feet. Sometimes, you don’t want to commit yourself to a long contract for services you are unsure about yet. Though most hosting companies offer money-back guarantee, at times you may not get your whole money back, or nothing at all. Therefore, as away of testing the services offered, after which, if you are happy with the host, you can then choose to purchase a yearly hosting plan. A 1-month hosting plan can be a good way to wet your feet before diving in the waters. Its very obvious that paying for your hosting account month after month is way too expensive, especially if you are planning to host for a period longer than a year. Many hosting companies also give a much higher discount if you are buying for a period longer than a year. Therefore, meaning that there is a lot of money you save if you host for 12 months and above upfront. 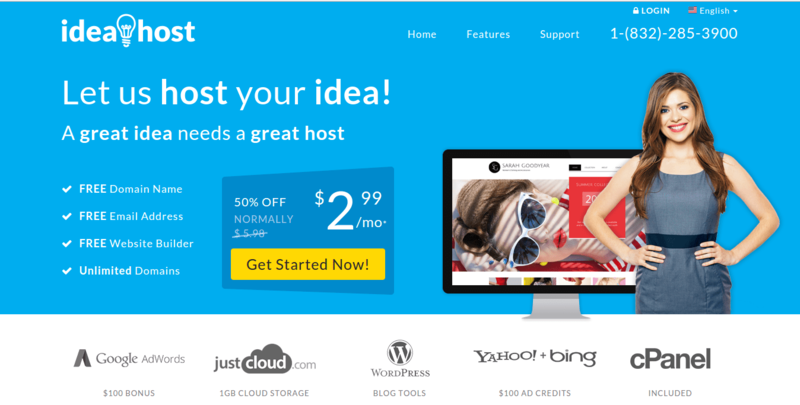 eHost accepts monthly web hosting at $13.98 per month with a 50% discount on your first month. You get unmetered disk space and bandwidth. You also get a free domain name, which remains free for as long as you still host with them, and unlimited domains can be linked to your hosting account. To get started and create a hosting account with eHost, click this link and get a 50% discount, or check out my eHost review and experience to see if eHost is really for you. The heavy-weight Godaddy, is also one of web host that allows you to pay per month. They are cheaper compared to eHost especially if you already have a domain name. 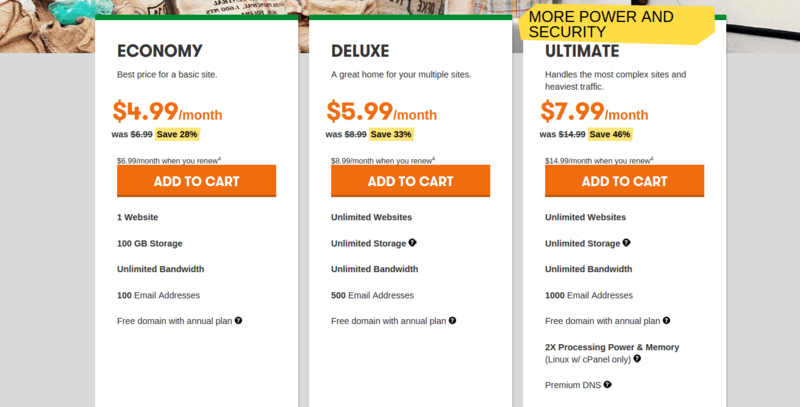 With their Economy plan for $6.99/month, you get to host 1 website, with a 100GB of storage, unlimited bandwidth, up-to 100 Email address and a free domain. However, unlike eHost, Godaddy’s free domain is not free for life. You’ll have to pay for it on your next account renewal. A Godaddy Delux plan allows you to host unlimited number of websites, with unlimited storage space and bandwidth. This plan also includes 500 Email addresses and a free domain, which is only free until your next account renewal. This plan costs $8.99/month. This can be great if you are planing to host more that one websites. Godaddy also has Ultimate hosting plan, which includes unlimited websites, unlimited storage space and bandwidth, a free domain and SSL Certificate for the first purchase period and a much higher processing power and memory. This hosting package goes for $14.99/month. If you feel Godaddy is what you want, click this link to create your hosting account with them, you also get over 28% discount for your initial hosting period. I got to know about ideaHost.com after I had started hosting with eHost.com, these two hosting sites are identical in my opinion. They have same website layout, offer same services, except for one thing, the price. For $3.98/Month you get 500GB Disk Space, Free Email Addresses, Unlimited Bandwidth and a free domain for life. The domain is free for as long as you are still hosting with them. A $5.32/Month package includes unlimited disk space and bandwidth, a website builder, free email addresses and a free domain for life (free for as long as you still host with them). The most expensive plan with ideaHost.com goes for $6.65/month. This package includes unlimited disk space and bandwidth, a website builder, $300 ad credits and a free domain for a period you host with them. They offer a 45 money-back guarantee, you can choose to cancel your account anytime between 45 days and have your money refunded without questions. You get a 25% discount with any of the above packages, to create your account click this link and start hosting your websites with them. As you can see from the screenshot above, Hostgator is yet another great web host that offers a monthly hosting plan. They offer unmetered disk space and bandwidth on all of their linux shared hosting plans. On Hatchling Plan $10.95/month, you get to host a single domain, with unlimited storage and bandwidth. You also get $200 ad credits for advertising on Google Adwords and Yahoo!/Bing. This is a good hosting plan if you plan to host only one website. If you plan to host more than one website, then Hostgator’s Baby Plan at $11.95/month is the right plan for you. This plan allows unlimited domains, unlimited disk space and bandwidth, plus $200 Google and Yahoo!/Bing free ad credits. The Business Plan at $14.95/month includes a unlimited disk space and bandwidth, unlimited domains, $200 ad credits plus a free toll-free number for your business. You can also ask for a refund if you are not happy with their services for the first 45 days. You get a 20% discount for your first month on any plan you choose, that if you choose to pay on a monthly basis. If you feel Hostgator is for you, Click this link to get started and create your hosting account with them today. FatCow.com is another great host you should checkout. They have just one hosting plan “The Original FatCow Plan” at $10.99 per month. This plan includes a domain (free for first year only), unlimited bandwidth and storage space, allows unlimited domains, $200 free Google and Yahoo/Bing ad credits, unlimited emails per account and a website builder. I find fatCow cheap especially if you plan to host on a monthly basis. Secondly, you can try them for just 30cents for your first month, see if they deliver to your expectation before you dive in. They also have a 30 Money-Back guarantee, if you are not happy, you get your money back. To create an account with fatCow, click this link and get started. I would love to read from you, if you know of any other better hosting company that offers month-to-month hosting, don’t be shy to mention it in the comment below. For any comment and questions, I’ll be more than glad to read respond to you. 1and1 Hosting Review 2015 – Do they Really Offer Such Cheap Services?